In this activity students create a classroom quilt with squares that represent each of their individual families. Children are often sensitive about their families and may be embarrassed by a characteristic they think is different even though they really love the people in their family (living with a grandparent, living with a single parent, living in a foster family, etc.) Your use of the term “family” rather than more specific terms like “mom and dad” or “parents” (plural) can help communicate your own value of all kinds of families. create a class quilt celebrating their families. ELA-Literacy.CCRA.SL.5 – Make strategic use of digital media and visual displays of data to express information and enhance understanding of presentations. Distribute hula-hoops in the classroom randomly. When the music begins, children who have been given hula hoops (or jump rope if you’re using rope big enough} find someone with whom they have a difference (someone who comes from a family with a different number of children, someone whose hair is another color, etc.). When they find someone with whom they have a difference, they’ll invite him or her to join them inside their hula-hoop or rope circle. When the music stops, children in hula-hoops will need to invite in anyone who’s not yet in a hula-hoop or rope circle by finding a difference between them. Play Don’t Laugh at Me song. Be sure to give children plenty of time before turning off the music. Do a second round if you have time. Process as a group what this activity can teach about diversity. How did it feel when the music stopped and you were not in a circle? How did it feel when classmates helped you find a circle? Write the word “family” on the board and ask students what the word means to them. Write student ideas on the chart in web form, drawing lines between related ideas. With whom do you live? Who else do you consider part of your family? What are some of the things you like to do with members of your family? What are special foods in your family? What holidays do you celebrate? Distribute art supplies and a copy of the nine-square patch to each child. 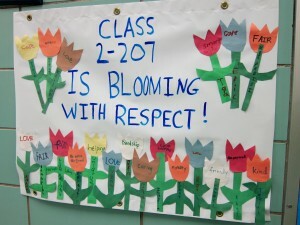 Ask students to decorate the middle square of the patch with the names of their family members. The remaining eight squares could describe, with words or images, things that are important to their families. Students can include anything they want—special foods, special pets, holidays they celebrate, special memories, etc. When students are finished, have them pair with a partner to share the stories of their families depicted on the patch. (Optional) In another class period, students can glue their patches onto construction paper backings and then work together to join their individual blocks on a large piece of butcher paper to form a class Family Ties and Fabric Quilt. Alternatively, they might connect the patches horizontally along the wall in a banner form. In a go-round ask each person to talk about something that is depicted on his or her patch. Guide students to notice that their patches reflect the diversity of their families. K-1: Begin the Main Activity by reading Who’s in My Family? All About Our Families by Robie H. Harris. Then proceed with the family web on chart paper. Follow instructions for grades 2-5 for the rest of the activity. Grades 6-12: Do the activity as described, but instead of web charting the word “family,” chart the word “culture.” Ask students to then pair/share the rituals, food traditions, favorite activities or “culture” of their families with a friend as preparation for the art project. Consider doing the squares on fabric to make a real quilt. Follow instructions for grades 2-5 for the rest of the activity. K-1 Literacy: Have students make their own family books. Give students pages for each member of their family with the sentence frame “I like to _________________with my ______________________.” Students illustrate each page. Invite families in to celebrate students’ work. K-5 Math: Have students make various graphs to reflect diverse family demographics within their classroom. Students can look at a number of variables: number of children; adults; boys; girls; and, pets. K-5 Literacy, Social Studies and Science: Read All the Colors We Are/Todos los colores de nuestra piel: The Story of How We Get Our Skin Color/La historia de por qué tenemos diferentes colores de pie by Katie Kissinger. See the back section of the book for ideas on acting out the science behind our skin color. 2-5 Literacy and Social Studies: Read The Case for Loving: The Fight for Interracial Marriage by Selina Alko. Have students imagine they were around when this case was before the Supreme Court. Have students write a “letter to the editor” expressing their opinion about the case. K-5 Literacy and Art: Read The Great Big Book of Families by Mary Hoffman. Teach students to make connecting papers dolls and have students trace and cut out enough to represent their family. If possible, provide people color construction paper or markers for students to accurately represent members of their family (Lakeshore’s version has 12 different skin tones). Connect all the paper doll families to “hold hands” as a border around the classroom. Grades 6-12 Literacy and Art: Read American Born Chinese by Gene Luan Yang, a graphic novel of a teenager’s experience of being the only Chinese-American student in his school. Create comic strips to represent your family’s story in America and make a class graphic novel. Grades 6-12 History: Study immigration by looking at the countries your students’ families are from. What was happening in their countries of origin when their families came? Who were the other immigrants at the time they immigrated? What traditions did they bring that influenced how America evolved? Grades 6-12 Literature: Read Tuck Everlasting by Natalie Babbitt with students. In this book, the Tuck family is very different from Winnie’s family. How do you think they feel about being different? Have you ever felt different? How has that impacted how you act with your peers?